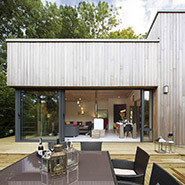 Vastern Timber’s British larch cladding is sourced locally from well managed forests. The majority of our larch logs originate from private woodlands within 100 miles of our sawmill, many of which are independently certified. The specie is ‘European larch’ and it is regarded as the ‘King of Larches’ because of its size and the superior wood it produces. The European larch tree grows widely across the cold northern reaches of Europe where the wood is very slow-grown and consequently very dense. In the UK, where the climate is warmer and wetter, the larch trees grow more quickly and the wood tends to be more knotty. 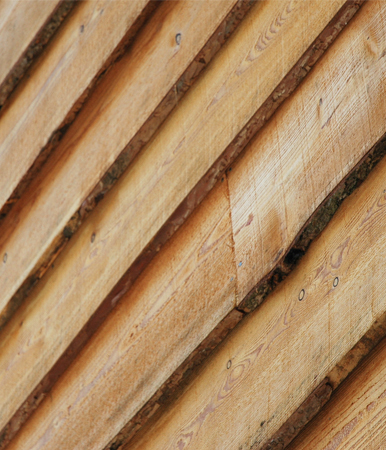 British larch is best suited to rustic cladding profiles such as sawn feather edge and waney edge, but with care, British grown larch can also be dried and machined to various cladding profiles. Our air dried larch cladding is either available as a B grade finger jointed board or as an A grade random length board, although this is available only in limited quantities. British larch cladding is our most cost effective cladding option, being approximately half the cost of oak and it offers a good alternative to Cedar and Douglas fir. British larch cladding is both tough and durable, making it ideal for exposed elevations and areas where knocks and scrapes are likely. 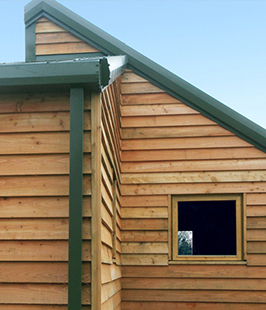 As with all durable species, British larch cladding is best left untreated. However if the silver colour of weathered wood is not desirable, larch wood will take exterior grade oils. Larch cladding is more ‘lively’ when compared to alternatives such as cedar, meaning that distortion and dimensional variation throughout the year are more likely. For profiles such as waney edge and feather edge where the larch is supplied green (wet), the cladding boards will be especially prone to distortion, and it is therefore essential to follow our fixing advice. British larch cladding is best suited to projects where a rustic appearance is desired, or where a quality cladding is required, but budget is a primary concern. Produced to comply with the harmonised standard for construction products regulation BSEN14915:2013 and to conform to BS8605-1:2014 External timber cladding: Method for specifying. Origin Legal and well-managed forests in England and Wales. Appearance British larch ranges in colour from pinky-brown in the heartwood, to creamy-white in the sap band. There are frequent dark brown knots, which can loosen as the wood dries, resulting in open resin pockets that may ooze during the first year and during subsequent hot summers. When exposed to the elements, the wood will, over time, weather to a silver- grey colour. Weathering As the boards weather the colour will change to a silver-grey. Larch is quite consistent and is not reactive, and as such, will weather relatively evenly. Northerly elevations may weather to a darker grey than those facing South. Working properties Good workability. Takes fixings satisfactorily. Extractives British larch contains resin rather than oil or tannin. The resin does not tend to bleed and is not reactive.